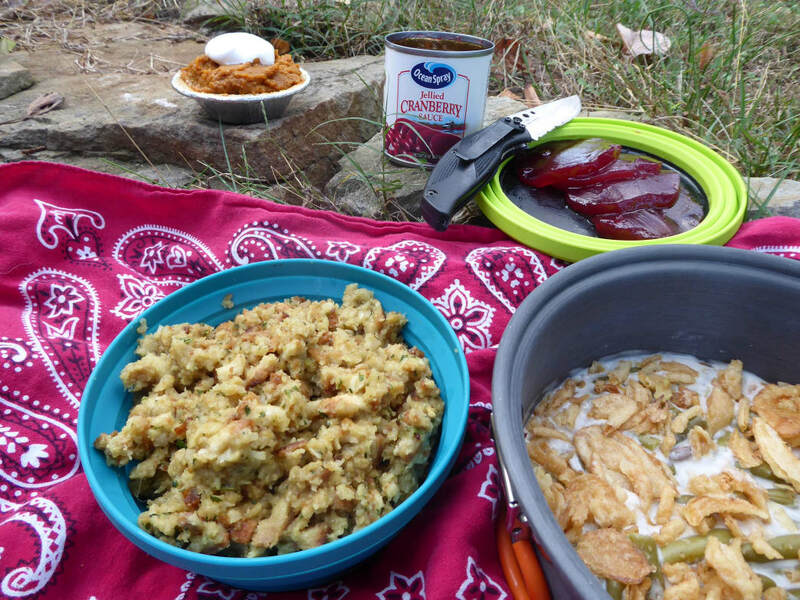 If you’re heading to the backcountry this Thanksgiving, you don’t have to forego a traditional holiday meal just because you’re away from civilization. With a bit of early meal planning and a trip to the grocery store, you can feast on turkey and all the trimmings while you’re enjoying a night under the stars. With this meal plan, you won’t spend a great amount of time prepping and cooking. But, you might need to pack a few items that aren’t as lightweight as what you’d typically carry into the backcountry. No, you don’t have to tote a Dutch oven, but you might need to carry a few canned goods, as well as extra pots and bowls to prepare and serve all of the food. If possible, eat your Thanksgiving feast the first night of any multi-day trip so you don’t have to carry the food weight for long. Also, you’ll need to adjust the following recipes to suit the size of your group. 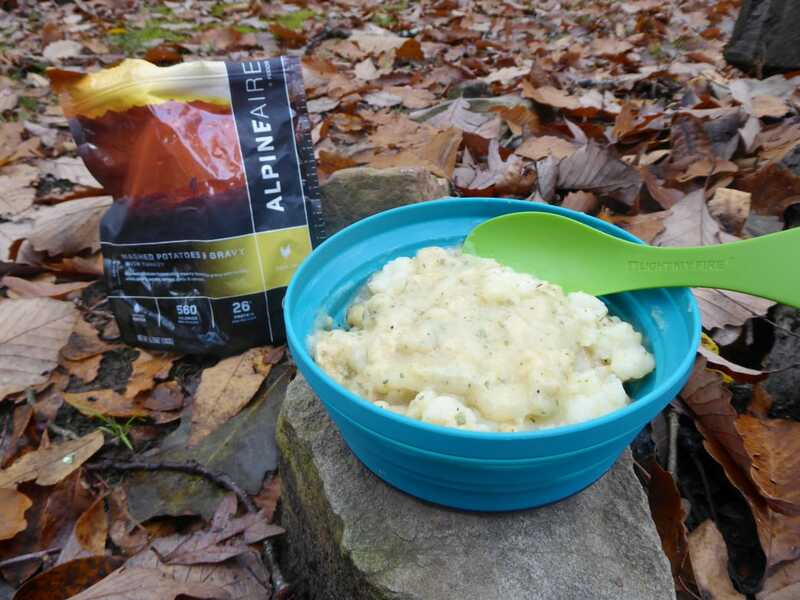 Alpine Aire offers one of the easiest ways to have turkey and gravy in the backcountry. Its Mashed Potatoes & Gravy With Turkey meal includes a separate packet with the turkey and gravy. You just put this mix in a pot, add boiling water, and let it stand for about 10 minutes. For the potatoes, you add boiling water to the main meal pouch and seal it for 3 minutes. This entree is not only easy to make, but each packaged meal weighs only 5.7 ounces and includes two servings. If Alpine Aire products aren’t sold in your local stores, you can order meals from the company website in advance of your trip. Making stuffing couldn’t be easier. Just pack a 6-ounce package of Stove Top Stuffing (you can ditch most of the box, and just carry the portion with cooking directions) and some olive oil. To make the stuffing, you simply bring 1½ cups of water and 4 tablespoons of olive oil to a boil, stir in the stuffing mix, remove it from the heat, cover it and let it stand about 5 minutes. If you’ve never used olive oil in the backcountry, it’s a good idea to carry it in a small, plastic screw top bottle that will hold the few ounces you need and won’t leak. In the South, it seems that Thanksgiving dinner always includes green bean casserole. 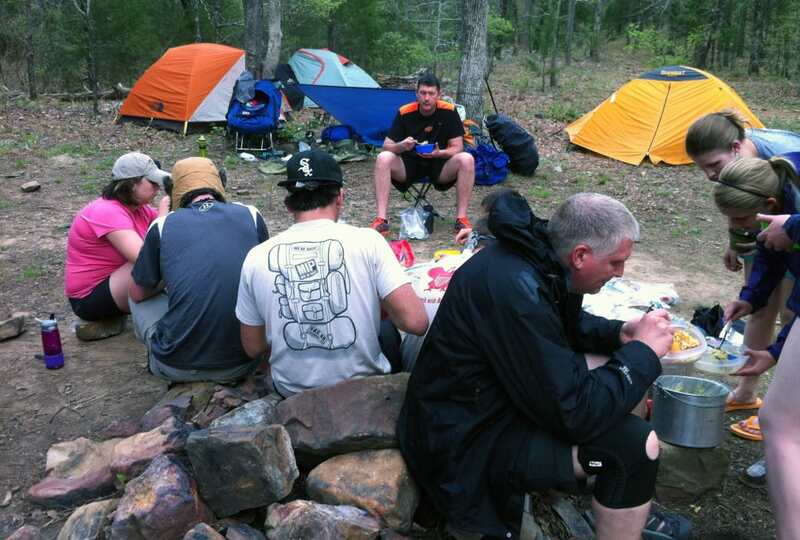 To prepare it in the backcountry, you’ll warm a can of Campbell’s mushroom soup and add cut green beans. It’s most convenient to use cut green beans from a can, but you can shave weight in your pack by using 0.4-ounce packages of Mountain House freeze-dried green beans. To prep these, you just add water to the pouch and wait 10 minutes. Once you’ve combined the mushroom soup and beans, top with French’s Crispy Fried Onions. You can buy the onions in a small 2.8-ounce plastic container, which will protect them in your pack. This is the easiest thing on the menu to prepare. Just open a can of Ocean Spray Jellied Cranberry Sauce, slice it up and serve. To save weight, bring a small 8-ounce can, and use a super lightweight P38 can opener. What’s a Thanksgiving feast without dessert, right? In the backcountry, it only takes a few minutes to make a tasty miniature pumpkin pie. Prior to your trip, mix 2 teaspoons of pumpkin pie spice with 2 teaspoons of sugar and carry this mixture in a small bottle or plastic bag. When it’s time for dessert, heat a can of pumpkin (the Libby’s brand is usually in 15-ounce cans), and stir in the mix of pumpkin spice and sugar. Then, dole out some of the mixture into a Keebler Ready Crust Mini Pie Crust. While some people like to make their own crust, these Ready Crusts are really convenient. Just don’t open the packaging for the crusts before you’re ready to use them, so they’ll stay intact, and carry them in the lid of your backpack. If you have the means to toast marshmallows, top your mini pie with this sweet, gooey goodness. Or, you can carry a small container of Marshmallow Fluff or Jet-Puffed Marshmallow Creme. There’s nothing better on a cool fall night than a hot and spicy drink. To quickly prepare hot cider, just add hot water to a packet of Alpine Spiced Cider mix, which comes in various flavors, including Spiced Apple Cider and Pumpkin Spiced Cider. To give your Spiced Apple Cider some extra kick, add dark rum. If you’re willing to invest a bit more time preparing drinks, check out the following recipe for a hot-spiced apple cider that resembles mulled wine.